IMO, Timothy Lazenby is the best Bond of all time. Give this one a chance! 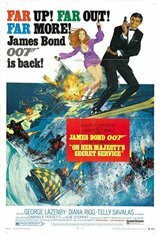 After a one film hiatus Sean Connery returned to the role that made him famous, and ON HER MAJESTY'S SECRET SERVICE is the Scotsman's finest Bond.